Ever mix a dog and a cat in a household? The end result may not be too pretty. What ’s worse is when your dog won’t let the cat eat of its own personal food bowl! That’s why it’s necessary to dog-proof your home along with your cats possessions. So, the solution? A Dog Proof Cat Feeder. If you decide to get one, your cat should be able to eat out of it with ease and no worries. The purpose of a dog proof cat feeder is truly in the name. Your dog (or anyone else’s dog) won’t be able to mess with the content. Have your cat feel like it’s food is untouchable! Your cat will surely feel like it’s the king, or queen, of the household and there’s no issue with boosting it’s self confidence (even if it’s with it’s own dog proof cat feeder). I will admit, as this is a solution to one problem, it may not fix others. For example, if you’re having issues with your blinds, carpets, or even your garden then this one item won’t dismiss all other concerns. It will, however, make it easier to take care of them as you’ve just crossed one problem off your list! The comparison table above will provide you with a summarized version of whats to follow so you can understand the benefits of each product swiftly. The Cedar Dog Proof Cat Feeder – This cat feeder is applicable indoors and outdoors as well! The best part? It includes a comfy bed at the bottom. It has a 6” opening so be sure to not have that large of a cat if you plan on using this dog proof cat feeder. The Purrfect Cat Dish– This one right here is the most recommended out of all. As it’s quite inexpensive it also does everything you’d want it to do! Made by a veterinarian you can truly trust that it’s built specifically for feline’s and nothing else. FeedSafe Feeding Station – Not only is it easy to clean but it also contains alternative exits/entrances. Whether you have more than one cat or are worried that your home decor may block the entrance ; it shouldn’t be an upcoming issue any longer. With two year warranty limited warranty you’d have a piece of mind when placing your order. As you can see, dog proof cat feeders are hard to come across. It’s more conveniently found online than locally (though you may get lucky). 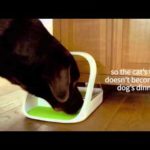 With a dog proof cat feeding station you and your cat will highly benefit from: less of a headache dealing with your dog and cat (or other pets and animals), an eased up cat with less worries, and more. It’s something you definitely want to look into for your beloved cat(s)! Now here we get creative. As mentioned above you can easily just buy a dog-proof cat bowl but it may not be in the best interest of your wallet. You can always let your imagination wander off here and place the cat bowl in all sorts of places. You may find a way of disguising it or protecting it with furniture. All of which are possible and legible things to consider. However for the sake of simplicity I will point out just a few things you can do. First, as mentioned in the title, elevate the cat feeder. I don’t mean place it on a couch (which can be problematic with all the spilling that may occur) but somewhere different. Position it where your dog, or other pets/animals, can’t reach. Keep in mind that your cat can most likely jump higher than your dog and other pets which puts it at an advantage. It’s always good to know your options. So, though these won’t be dog-proof, we will discuss stylish cat bowls which are elevated from the ground in one form or another. I won’t spend too much timing getting into details about the 3 cat bowls listed in the table above but I would like to point out that they certainly are something to look into. Whether you’re looking for a bowl that will help with your cat’s posture or stimulate his or her hunger by a design you can get them for not much of a cost. Unless, however, you intend to get the luxurious set for your king, or queen, feline. To keep things to the point, short, and simple, it’s not too difficult to raccoon-proof a cat feeder. Now the first thing to be acknowledged is that a wild raccoon should not be in your household. So, the most uncomplicated solution would be to bring the feeding station indoors. After doing so any raccoon shouldn’t have access to your cats’ precious food. If, however, for some reason you must have it placed outdoors, there are some things you can do. Initially, unless you have hordes of raccoons visiting your home, you can trap the raccoon (which we cover here). Another alternative is to place the feeder somewhere a raccoon can’t reach which is similar to the elevating section we just covered (I recommend reading through it to understand what is being referenced if you have not already). Lastly, I would advise you to put the food out during the day. Since your cat(s) may not be eating at night there is no need to keep the food out for un-welcomed raccoons and other uninvited animals. By doing 1 of these 3 things you can immensely lower the chances of having to worry about a raccoon. Do all 3 together and you may have just completely solved your problem! Best of luck and, on the chance you may harm the raccoon by trapping it, we suggest researching your local rules on raccoons to make sure you abide by the law.